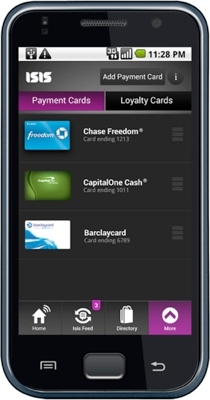 Isis, a mobile-payments joint venture born from an alliance between Verizon Wireless, AT&T, and T-Mobile USA, announced today that it will begin trials in mid-2012 with three card services partners: Chase, Capital One and Barclaycard. The partnership was unveiled at Mobile World Congress 2012 in Barcelona alongside a first glimpse at what the interface to the Isis Mobile Wallet looks like. Like rival service Google Wallet, Isis is counting on near field communication (NFC) to become the de facto standard for making purchases using a mobile phone. Although it has lagged behind Google in rolling out its alternative, Isis has already secured some very important partnerships, locking up deals with payment networks Visa, MasterCard, American Express and Discover, as well as a handful of device manufacturers and now three major financial institutions. There are still very few NFC-enabled handsets out there, and Google Wallet has already hit a couple of snags, so the fight for dominion over mobile payments is just getting started. Isis mobile payments will only be available in its test markets at first, which includes Salt Lake City and Austin, Texas. The national rollout isn’t expected until sometime next year. The company says that each of the banks participating will be able to tailor their cardholder service experience within the Isis Mobile Wallet to reflect their respective brands and ensure a seamless and secure experience across physical cards and mobile platforms. Besides mobile payments, customers will also be able to store loyalty cards and special offer coupons in their Isis wallets.